Between working at the bank and working on the house , I find myself with little energy left at the end of the day. It was hard enough to find the energy and motivation to cook for Mike, but now I have my younger brother to feed, too! No complaints, though! * Except for the fact that he eats enough for 3 people. I made this dish thinking there would be plenty of leftovers. Boy, was I wrong. So, in my case, this dish fed 3. I think that you could easily get away with making this for a group of 4 or 5, though! But hey, at least it was easy to make! Butterfly the chicken and then cut in half. Tenderize the chicken and season liberally with salt and pepper. Dredge through flour and shake off excess. Heat 2 tablespoons butter and 1 tablespoon olive oil in a large pan over medium-high heat. **When butter and oil start to sizzle, add chicken to pan. Cook until browned, flip and cook until other side is golden brown and chicken is fully cooked. Remove chicken to plate. Cook remaining chicken in same manner, using more butter and olive oil as needed before each. Add lemon juice, broth and capers to pan. Bring to a simmer, scraping pan to release browned bits for more flavor. Add more salt and pepper if desired. Add 2 tablespoons butter and stir until melted. Pour sauce over plated chicken and garnish with chopped parsley. *Ok, I have one complaint – my parents didn’t take me to Italy with them. They get Italy, I get my brother. **I have this Calphalon pan. I love love love it. It was big enough to cook 5 pieces of chicken at a time without over-crowding the pan. 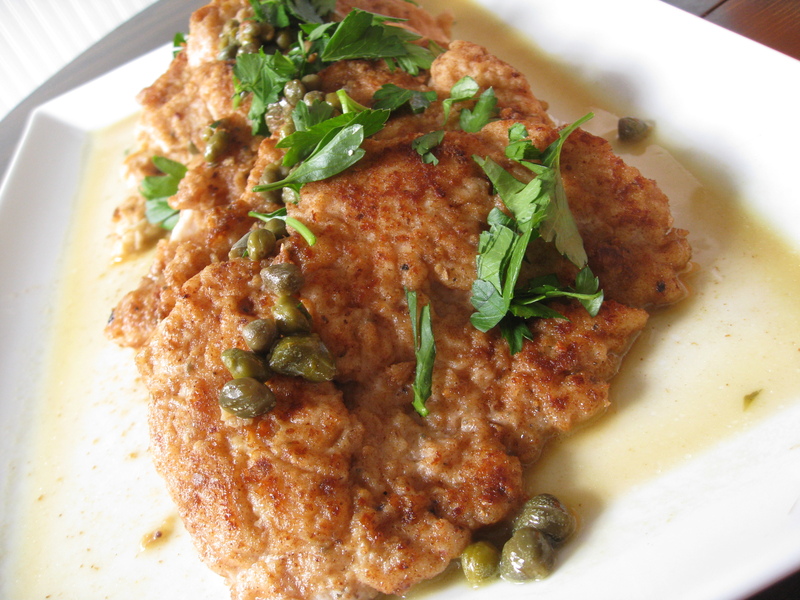 Categories: Chicken, Main Entrees, Meat | Tags: chicken, lemon, main dish, meat, pasta | Permalink. Here’s an interesting twist: Try marinating the chicken in a ziploc bag full of RC Cola! It really adds a neat flavor to the meat! how do you get your chicken so nice and brown? i tried this and it doesn’t look like this at all! Hey Jana, make sure your pan is hot hot hot!! Adding the chicken and then waiting for the pan to heat up won’t give your chicken a nice brown crust. Also, make sure that you get a nice coat of flour on the chicken. Make sure to shake the excess flour off!